6 Do you not know that a little leaven leavens the whole lump? 7 Cleanse out the old leaven. One of the things I attempt to do here at Apprising Ministries is to follow developing trends within the professing Christian church and expose the growing apostasy within the mainstream evangelical community, Much of it today is actually rooted in the ill-fated Church Growth Movement, which was birthed by an American evangelicalism that never fully renounced its inherent humanism. It should be noted that among notable neo-evangelicals we will find Southern Baptist minister Billy Graham.1 In Dr. D. Martyn Lloyd-Jones On Secondary Separation we were reminded that Lloyd-Jones refused to work with Graham because he “would [not] stop having liberals and Roman Catholics on his platform.” You may recall that I’ve mentioned before that, like a lot of people, I had once looked to Billy Graham as a Christian example to be greatly admired. That is until troubling quotes and questionable associations he’d been making through the years kept coming up in my research. Unfortunately, many people think that Graham’s age is a factor in what’s thought of as later apostasy. You’re about to see, this is not so. In fact, Billy Graham has long exemplified the blurring of important doctrinal distinctives which has become so prevalent within the mainstream of the church visible. For example, consider that his organization awarded a blatant false prophet who works closely with quasi-modalist and prosperity preacher T.D. Jakes: Word Faith Heretic Cindy Trimm Receives Award From Billy Graham Evangelistic Association. Then there’s fellow Southern Baptist, “America’s pastor” Rick Warren, openly embracing a high-ranking Roman Catholic apostate: Rick Warren And His Brother “His Eminence” Timothy Dolan Archbishop Of New York. when he appeared on the Christian scene in the late 1940’s he certainly did not, at that stage, compromise on the uniqueness of the Person and the work of the Lord Jesus Christ, in fact in 1948 [Billy Graham] made this statement. He said: “‘the three greatest menaces faced by orthodox Christianity are Communism, Roman Catholicism, and Muhammadism,” which we know is Islam today. The sad thing is that having made that very commendable statement he then subsequently proceeded to retreat on all fronts. Next we’ll consider some more examples further illustrating the 1960 Decision article to which MacArthur refers. First, there’s the “Hour of Power” MacArthur quotes from in the above video. Specifically, program #1426 entitled Say “Yes” To Possibility Thinking, which was originally broadcast May 31, 1997. You are about to see Billy Graham tell you that someone can love Christ, and know Christ, and not even be conscious of it. So now we have a salvation by osmosis? Graham: I think everybody that loves Christ, or knows Christ, whether they’re conscious of it or not, they’re members of the Body of Christ. And I don’t think that we’re going to see a great sweeping revival, that will turn the whole world to Christ at any time. I think James answered that, the Apostle James in the first council in Jerusalem, when he said that God’s purpose for this age is to call out a people for His name. And that’s what God is doing today, He’s calling people out of the world for His name, whether they come from the Muslim world, or the Buddhist world, or the Christian world or the non-believing world, they are members of the Body of Christ because they’ve been called by God. They may not even know the name of Jesus but they know in their hearts that they need something that they don’t have, and they turn to the only light that they have, and I think that they are saved, and that they’re going to be with us in heaven. Schuller: This is fantastic. I’m so thrilled to hear you say that. There’s a wideness in God’s mercy. Oct. 29th 1963 Dr. Graham admitted to the ‘Daily Journal’ of International Falls, Minn., that at a Graham Crusade in San Paulo Brazil the Roman Catholic Bishop stood beside him and blessed the converts as they came forward. Graham said that this illustrated ‘something tremendous, an awakening of reform and revival within Christianity’ was happening. (‘New York Times’ Nov. 9th, 1963). I offer that this would be news to the Lord’s Reformers like Luther and Calvin, not to mention scores of powerful men of God such as Charles Spurgeon. 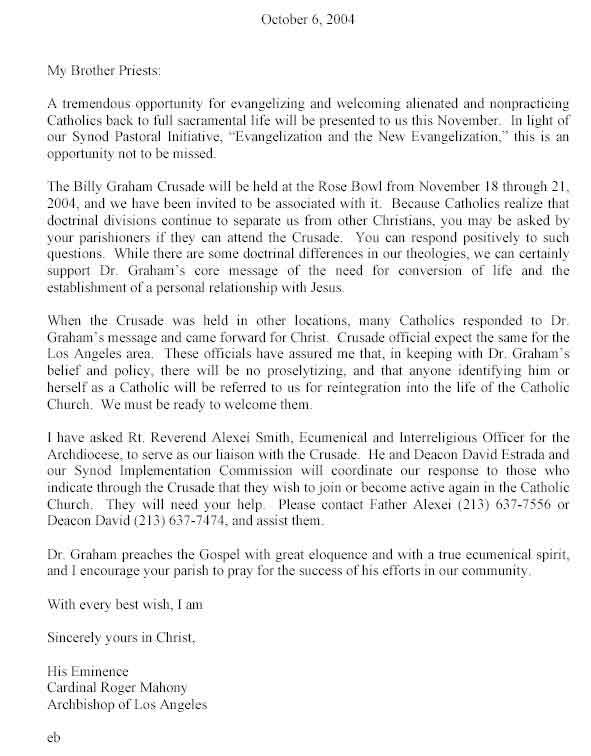 These all recognized that Rome’s condemnation of God’s Gospel itself will forever separate us from the type of “cooperation” that Graham is talking about, where he has Roman Catholic parishes (they are not churches in a Biblical sense) as part of his gospel crusades. In 1964, Richard Cardinal Cushing, the renowned [Roman Catholic] archbishop of Boston, shook up the Catholic Church by praising Billy Graham. Encouraging Catholics to hear the evangelist, Cushing remarked that he would stop worrying about the Catholic Church’s future in America if they had half a dozen men like Graham. [Roman] Catholic and evangelical efforts toward fellowship have largely followed the Cushing-Graham model. (source). A tremendous opportunity for evangelizing and welcoming alienated and nonpracticing Catholics back into full sacramental life [i.e. the Roman Catholic Church] will be presented to us this November. Since the early days of his ministry, Graham has worked hand-in-hand with Catholic Churches and has often expressed his belief that Catholics who are faithful to Roman Catholic teachings are saved. While I certainly believe that Catholics can be saved, those who believe the Church’s doctrine on salvation must be excluded because the doctrine denies that salvation is by faith alone. It is a simple but effective argument that cannot be denied without seriously twisting the words of Scripture, for the Catholic doctrine stands in direct opposition to the truth. There’s just no basis for fellowship between the Christian and the Roman Catholic Church. Yet you’ve just seen examples of Billy Graham in fellowship with Roman Catholic priests, refusing to try and convert people from apostate Roman Catholicism, and actually sending them right into Roman Catholic parishes. So you should be able to see that the evidence has been there all along. This has always been Billy Graham’s policy in this area; and he truly has been compromised for many decades. As I already pointed out, the tragic result for those following Graham’s Reformation-denying example is an inclusivism, which has now slithered its way into the very heart of the mainstream visible church. This cursed ecumenical spirit of compromise has become what I’ve referred to as the Ecumenical Church of Deceit with its Seeker Driven-Purpose Driven sector a la Rick Warren, the Emerging Church “twist to universalism” offered e.g. as the Love Wins mythology of men like Rob Bell, and the selfish self-esteem “whichever way the wind blows” message of Joel Osteen. This is a very real part of the legacy of Billy Graham. which is vividly illustrated by the recent Christian Post piece Billy Graham Is ‘One of a Kind’ Says Mark Driscoll; Rick Warren, James MacDonald, Bible TV Series Producers Share Sentiment. No, Graham is actually a grandfather of many of his compromised kind. Sadly, he has had an enormous influence within evangelicalism; but Graham’s is not an example to be admired at all. Let us be praying that Billy Graham will publicly repent of his inclusivism and ecumenicism before it’s too late.